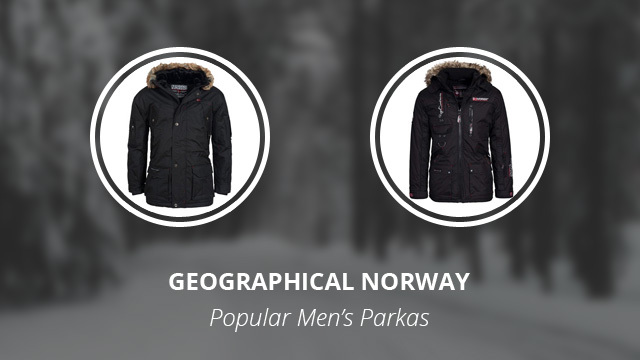 In this article we present some of the most popular Parkas for men that you can find online by the brand Geographical Norway. If you like this brand, you absolutely can’t miss this amazing collection: 9+ Parkas for men which have a large number of good online reviews. 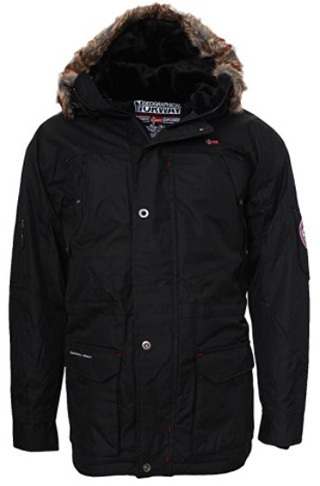 The Polar Alaska winter parka is a heavy winter jacket that comes in the color Black. It is a long jacket, with oversized sleeves and a nicely sized hood that comes with a faux fur lining. The fur is removable by zipper, so it can be worn according to preference or weather. There are two large side pockets and two on the upper chest. As for on the inside, there are two large pockets on each side and a smaller chest pocket. The main closure is a full zipper, with a storm flap on top that closes with snap buttons. The material is 100% Polyester on the outside, with the inside lining made of fleece. The Alaska winter parka comes with a hood lined with fleece and with faux fur that can be removed. The material is 100% Polyester for both the outside, as well as the inner lining. 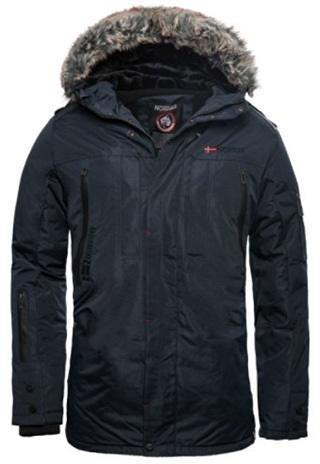 It is a heavy winter jacket, water-repellent, windproof and highly breathable. There are two large pockets on the sides, two on the chest as well as two on the sleeves. There are also pockets on the inside. The cuffs on the sleeves are ribbed, for better insulation as well as added warmth. There is Velcro on the sleeves, as well, for proper adjustment. The main zipper is covered with a buttoning flap and there are two colors available: Black and Navy. 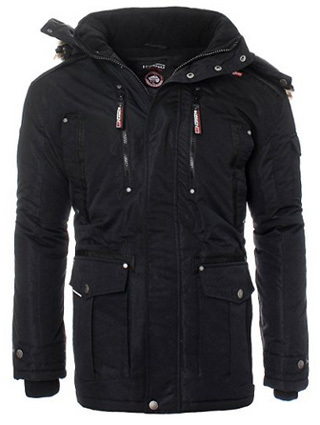 The Dicker Alaska parka comes in the color Black. It is made of 100% Polyester, with the inner lining being fleece. 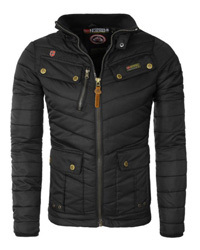 The fleece on the lining is quilted, so that it can provide more warmth and also help in maintaining it for longer. The hood comes with a fleece lining, as well as removable faux fur for a more stylish look, but to also add some protection to the face when in harsh weather. There are two side pockets, two chest pockets and another pocket on the left sleeve. The main zipper is a two-way one and it is covered by a weatherproof flap. The Avoriaz parka is designed for the lowest of temperatures. Its name refers to a French mountain, known for winter sports and snowy weather. 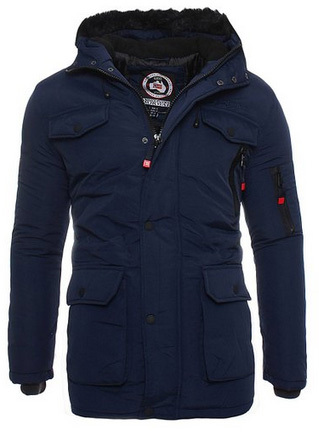 This jacket is made of Polyester and it is weatherproof, as well as highly breathable. There are two large side pockets, and a pocket on each side of the chest. There is also a safety hoop on the right side, for those who prefer trekking or going for hikes in high altitudes and challenging terrain. 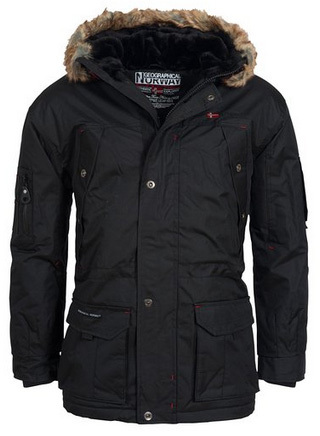 The jacket comes with a removable hood, lined with faux fur that is detachable. The collar is high and it zips up with the main zipper, which is uncovered on top, but comes with back covers, to protect against snow and rain. It comes in the color Black. 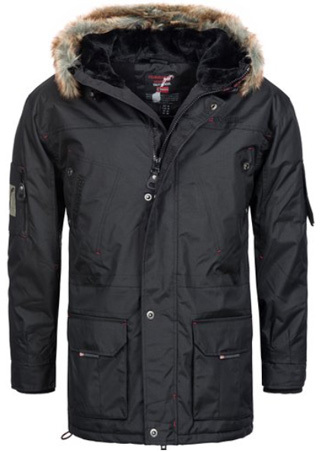 The Alos parka is a very elegant looking jacket, that comes with a black faux fur lining. The hood comes with a fleece lining and it is attached, whereas the fur lining can be removed. The cuffs are ribbed and the zipper covered, going all the way up to the collar, which is high and comes with snap buttons as well. There are several pockets, with two being on the sides, two on the chest, one on the left sleeve and one on the inside. It is made of 100% Nylon for the outer lining, and Polyester for the inner lining of fleece. It is a very suitable jacket for those who prefer being for long outside during winter, because it’s weatherproof and great at providing warmth. There are two colors available: Black and Navy. Baileys is a winter parka that comes with an oversized and removable faux fur lining on the hood. It is made of 100% Nylon for the outside and 100% Polyester for the inside. The main zipper is covered with a flap that goes all the way to the collar, fastened with Velcro. The cuffs are ribbed and elastic and there are plenty of pockets for the valuables. Two of those are on the sides, two on the chest, one on the left arm and one on the inside. It is a windproof and water-resistant jacket, that comes with a highly breathable design and material, making it very suitable for being active in cold weather. It comes in the colors Black and Navy. 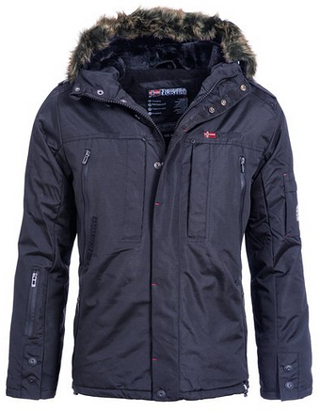 Chamonix is a heavy parka, which comes in the color Black and has great insulation. It is made of Polyester both on for the outer and inner part. There are quite a lot of pockets, with seven of them being on the outside and one on the inside. There are two side pockets, four on the chests, two of which zippered and two with snap buttons, and one on the left sleeve. The cuffs are made of elastic ribs for proper fitting as well as protection against the cold. 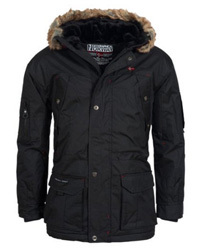 It comes with a high collar that adjusts with snap buttons, as well as a detachable hood, lined with removable faux fur. The cut is slim, with the sleeves designed to allow for comfort and mobility, making it a good choice for outdoor activities. 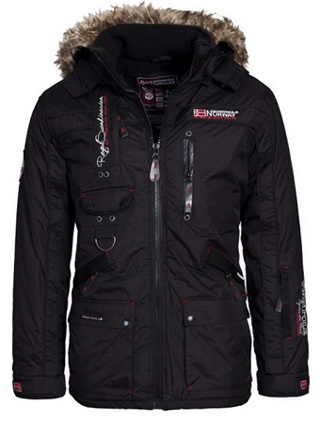 The Outdoor Function jacket, is a winter parka made of 100% Polyester. It is weatherproof as well as highly breathable. 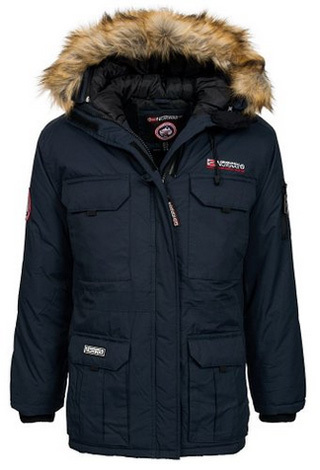 It comes with a faux fur trim on the hood and a high collar, to protect against the cold and wind. There are two side pockets, two chest pockets, as well as two other hidden chest pockets with snap buttons. There are pockets on each sleeve as well as one pocket on the inside. The main zipper, as well as the pocket zippers, are water-resistant and covered. The cuffs come with elastic ribs, as well as snap buttons on the outside. 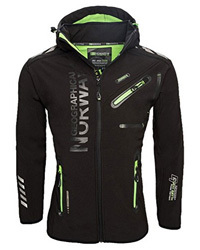 It is a jacket designed for movement, warmth and comfort. It comes in two colors: Navy and Black. This parka is one designed not only for comfort, but for functionality as well. It is made of 100% Polyester and has an inner fleece lining, this included in the hood as well. The collar is high and it secures with a snap button, after the zipper is fully closed. The hood is oversized, warm and comes with a removable faux fur trim. The cuffs are elastic ribs, part of the snow skirt, which makes this jacket weatherproof and snow-resistant. There are six bungee cords on this jacket, two on the neck, two around the waist and two on the hem, so it can be properly adjusted. There are also several pockets: two on the sides, two to the front, two on the chest, two on the sleeves and three on the inside. This jacket comes in the color Black. 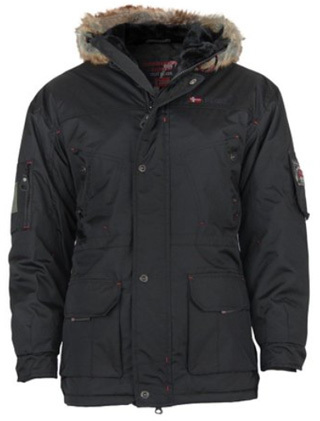 The Crown parka is a hip-length jacket, with a faux fur trim lined hood. It comes in two colors: Black and Navy, and it is made of 100% Polyester. There is one pocket on the inside and several pockets on the outside, located to the sides, front and chest, as well as two of them on the sleeves. 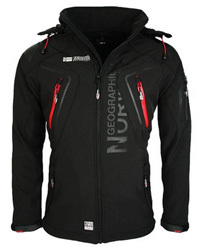 The main zipper is covered and the collar is high, protecting against the wind and cold, while providing insulation as well. It is a very casual jacket, which can be worn daily, but with the features it comes with and the warmth it provides, it can certainly be worn for outdoor winter activities.